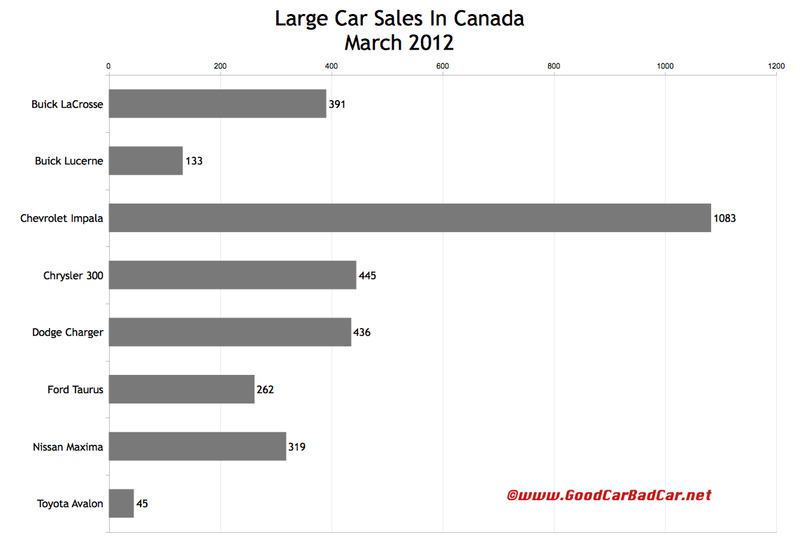 Canadians registered nearly 74,000 new passenger cars in March 2012. More than 8% of those sales were Honda Civics. Canada’s best-selling car ended the month 928 sales ahead of the Hyundai Elantra. 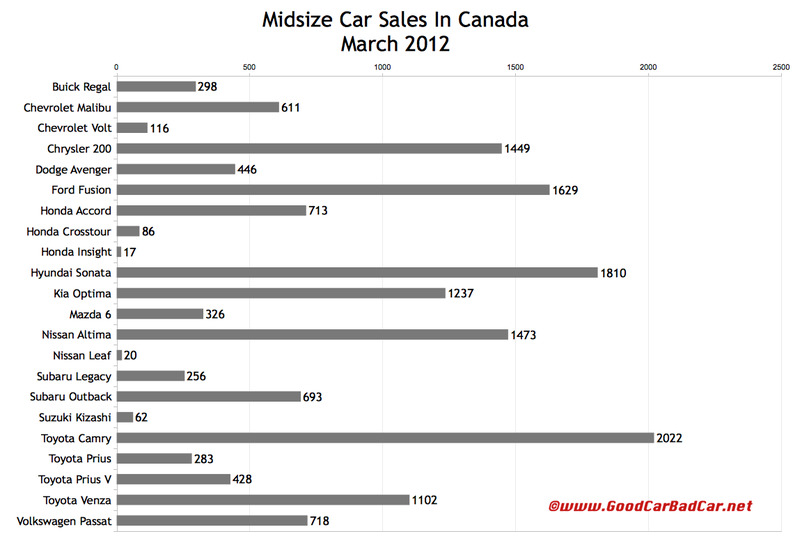 1007 of the Elantras sold in Canada last month were Touring wagons. Clearly the Civic’s direct rivals help make the compact category Canada’s leading group. From the Honda and Hyundai to the Toyota Corolla, Mazda 3, Chevrolet Cruze and Ford’s Focus, Canada’s six best-selling cars in March were C-segment cars. One size class down – or at least a step down a price – the Hyundai Accent topped the Nissan Versa for a class victory. Ford Fiesta sales slid 16% to 1130, 225 units behind the Versa. Kia’s Rio, based on the same platform as the Hyundai Accent, found 1061 buyers in March. 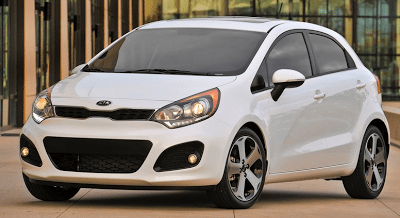 Combined, the Hyundai/Kia pair brought in more than 3000 sales for the Korean conglomerate. Hyundai also sold 332 Velosters. Toyota’s Yaris and brand new Prius C combined for 1244 sales. Chevrolet sold 17 Aveos and 840 Sonics. Honda Fit sales were up, but only to 473. It’s clearly overshadowed by the Civic (and Civic deals) in Honda’s Canadian stores. Mazda 2 sales were cut in half. Fiat, a truly small small car, out-sold the Ford Fiesta. 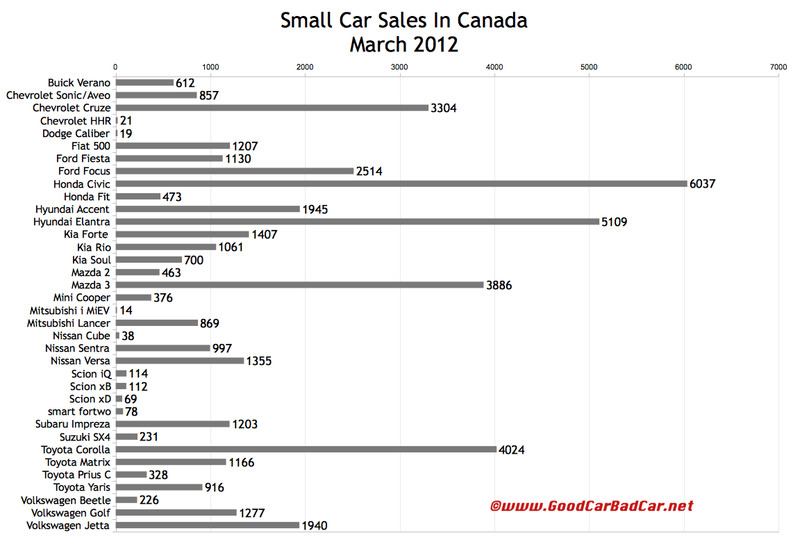 Mini, smart, and the Scion iQ are bit players, combining for 568 Canadian car sales last month. 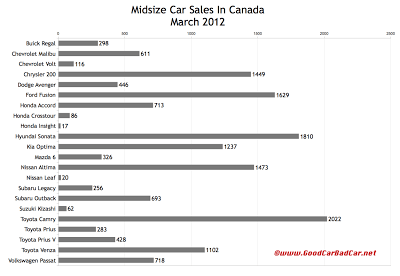 March 2012 sales data for these small cars, 22 midsize sedans and wagons, and eight large mainstream sedans can be seen in the tables after the jump. You can click any of the accompanying charts for a larger view. Toyota sold 2022 Camrys, 426 of which were hybrids. Chrysler 300 sales shot up 695% from next-to-nothing to a Charger-conquering 445 units. 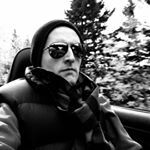 Monthly and yearly sales figures for every vehicle on sale in North America can be accessed through the dropdown menu at the top right of this page.